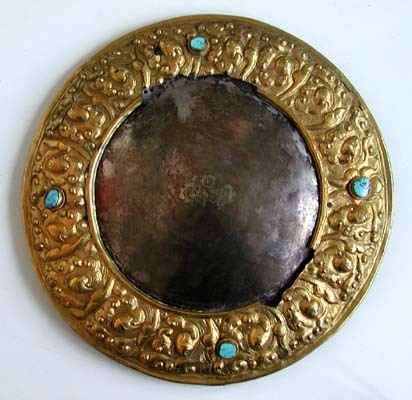 When advising the Dalai Lama, the State Oracle wears an elaborate costume, including this mirror on his chest. In deep trance, he looks into the mirror, not directly, but through another mirror held by an assistant in front of him. Through this doubly distant vision he foretells the future and gives advice. "Seven metal" silver alloy, gold, and turquoise.